SEAMAN JOB INFO - Agile Maritime opening hiring needs Filipino seaman crew deployment mid/end Dec 2018 to join on LNG carrier ship with trade route worldwide. 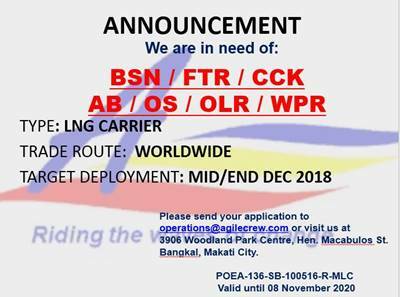 - Applicant must possess of valid Basic Training for Liquefied Gas Tanker (BTLGT) with COP. - At least 1-year sea time experience. 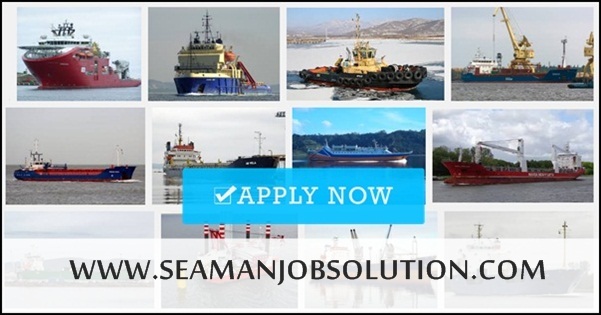 Share to help other seafarer looking jobs at sea. Maritime news that matters most to you and your business. Get working instantly maritime vacancies. Maritime & offshore career guide. Search all the best site for marine job opportunities. 0 Response to "Able Seaman, Ordinary Seaman, Oiler, Wiper, Bosun, Fitter, Chief Cook"